Hello everyone and welcome back to another post! Recently, I've been into all things RWBY and this led me to the upcoming RWBY game, Amity Arena. I was lucky enough to be a participant in the official Closed Beta Test, and I'd like to take some time to share my experience with everyone else! 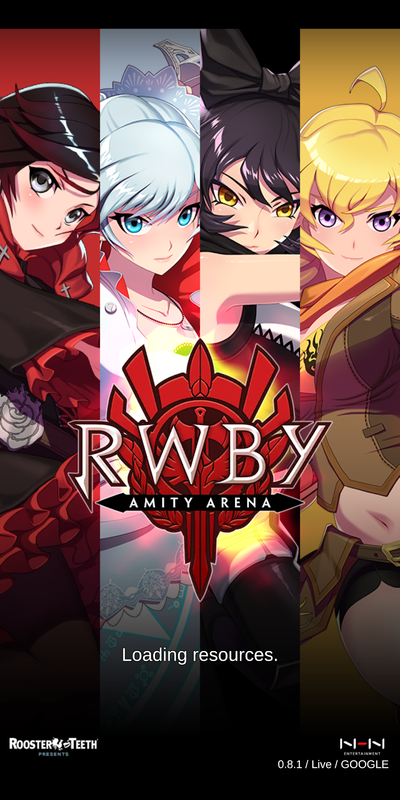 With a name like Amity Arena, many predicted this new mobile game to be a fast-paced fighting game. This guess wasn't too far off, as the app is packing the combat. However, the differences are clear with the end result being a card-based tactical game. On the surface this may sound unappealing; being a clone of the usual mobile games. While the game does take certain elements from other games (such as mobage character enhancing and a stamina based system) the game pushes forward with a few new integrations. 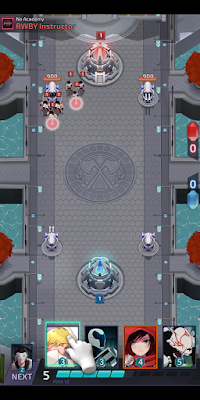 Upon starting the game, players are directly thrown into a tutorial. This tutorial is definitely well-placed and not overbearing, as the game can be confusing without proper explanation. 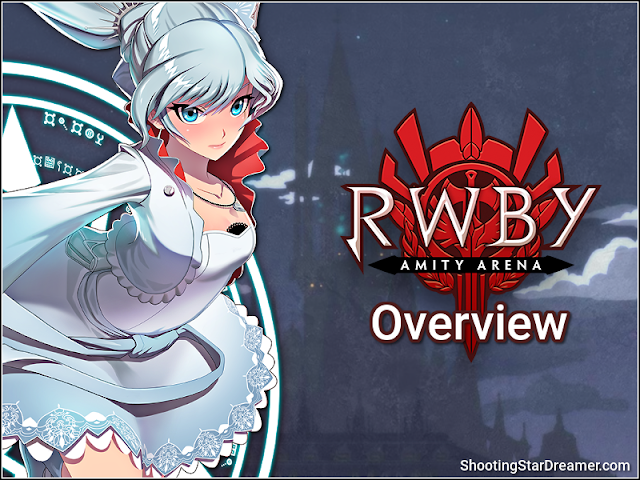 We play a practice match, learn the controls, learn the rules, and are given a few iconic RWBY characters to begin. A small arena that changes based on the player's ranking. These changes mostly seem to be aesthetic and feature settings from RWBY such as Beacon Academy. 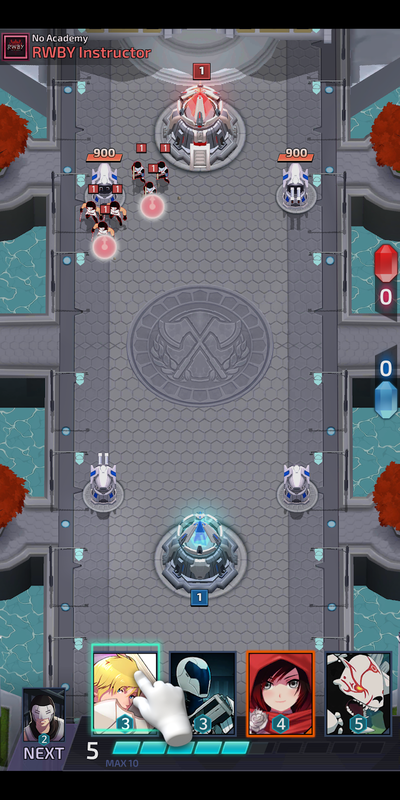 Each player has one tower and two turrets that attack nearby enemies and take damage when attacked. The goal of the game is to destroy your opponent's tower. The main central tower is the most important, and destroying this one is an automatic win. Otherwise, the player who destroys the most structures wins. In order to attack towers, players are given characters in the form of cards. These characters have different abilities and rankings which relates to how much aura (bottom blue bar) is used. Aura regenerates during the match at a set rate. Characters who are placed on the map attack whats closest to them, or proceed to the nearest enemy tower. Character's attributes vary; there are ranged and physical attackers, as well as characters with special effects based on their rarity. Thus, these are the basic game play mechanics of Amity Arena. Playing the game is more complex, but the overall concept is simple. 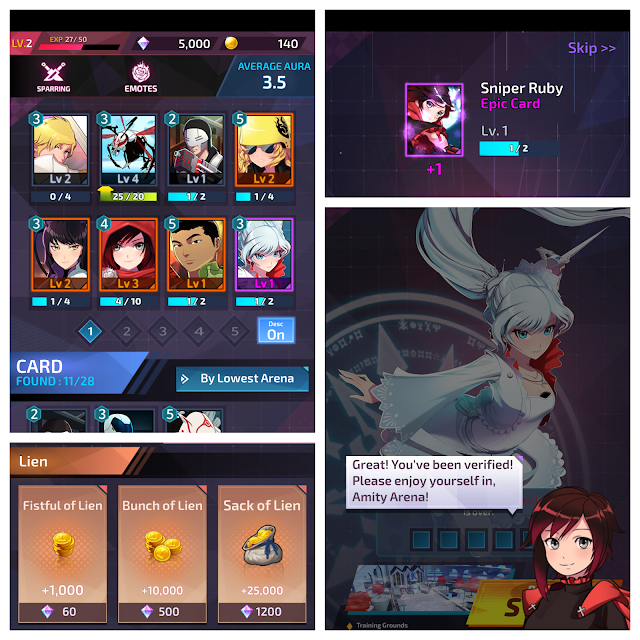 If you are familiar with games such as League of Legends, this RWBY game isn't too far off. Lastly, a very important game play element is the upgrade and currency system. The characters of the game are displayed as cards, with various attributes. Like many mobile games, in order to make these warriors stronger, players need to collect more of them. Afterwards, they can be upgraded using Lien which is gained from quests and battles. This sounds easy enough, but Lien was somewhat difficult to come by in large amounts. This is a big issue, since stronger characters require more money to upgrade. The game of course allows purchase of currency with real-world money, which would solve this problem. Getting stronger and more powerful characters revolves completely around upgrading them. The design of this system is somewhat problematic and leads to pay2win game play as you can spend money to boost your character near-infinitely. More info on this will be discussed below. The main RWBY characters have different versions/outfits. 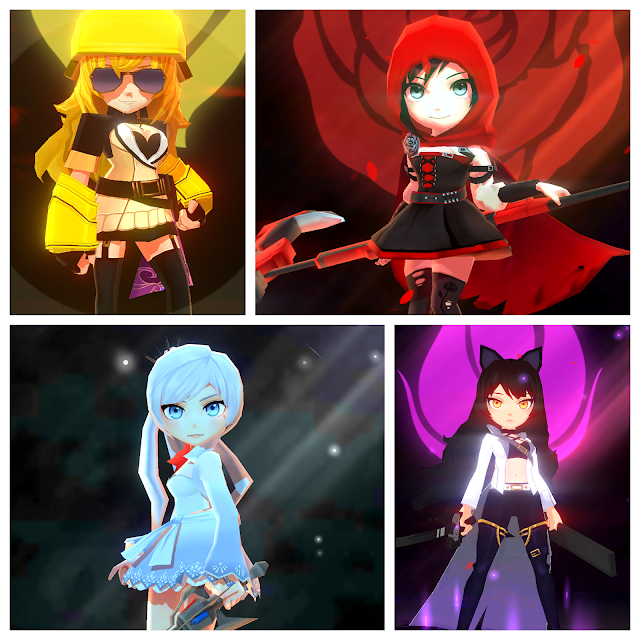 (Team RWBY has their new outfits while having versions of the original seasons.) The ability to use different characters is unlocked based on arena ranking. 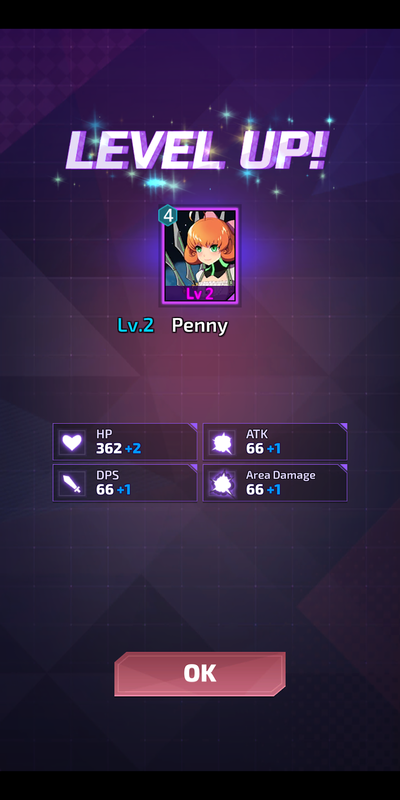 For instance, Arena 2 gives access to characters such as Penny that are unobtainable in Arena 1. Once the character is obtained they can be used regardless of rank. Characters are gained through treasure chest drops which you receive after every battle. You can open these with keys. You are given 5 free keys a day. Other chests can be purchased using crystals, an alternative currency. Leveling up increases your strength of towers and HP. So far this does not contribute to anything else. So far there is no single player mode; the entire game is PVP. The opponents you are matched with are determined by your PVP ranking, which splits players into separate arenas. First of all, I'd like to say that I definitely enjoyed Amity Arena. As mentioned, I love RWBY and it's wonderful cast of characters. Regardless, as this game is still in the development, it isn't without it's issues. One major problem that sticks out like a sour thumb, is the Pay2Win nature. While skill plays a part in game play, it can only get you so far. Upgrading characters is a major part of the game and is necessary to win. 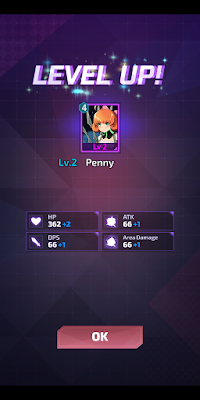 Pay2Win comes into play here, as upgrading is done by spending in-game currency which isn't attainable in huge amounts without outside resources. Therefore, players who aren't spenders will always be at a disadvantage compared to those who spend, which is a dire issue. There also wasn't a moment where my battery wasn't being drained. Battery consumption was killer while using the application, which I hope is fixed. An option to lessen graphic settings would help in this regard. Starting out is somewhat difficult. For each win you gain points, but you also lose points when things don't go your way. A string of losses can knock you back down to lower rankings, making it hard to get anywhere especially in the beginning. It's not always an even playing field as well, with matchmaking pairing you against higher ranked players with characters you don't have access to. This is another thing that needs to be worked on. It's not all bad though! There are many pros, like the beautiful artwork, the wonderful music, the addicting and intriguing tactical game play and more. I also liked that most of the character retained their voices or had lines referencing the main series. This definitely adds character to the game. With all that said, are you guys looking forward to the game? Is it a hit or a miss? Were you expecting something different? Let me know in the comments below!